Srikanth Iyer, 35, a senior professional at an advertising agency had an unmistakable ability to catch a nap in the elevator. At times he had a strong urge to sleep behind the wheels at the traffic signal. Often, he would wake up dehydrated and severely tired but would continue with his schedule, day after day. One day he had a brush with an accident. Miraculously, he escaped with minor injuries. In a candid chat with his doctor, he confided that he had dozed off behind the wheel. Immediately, he was referred to a sleep specialist. After a primary investigation, the sleep expert sent him to a sleep study lab to study his sleep pattern overnight. Post-study, he was diagnosed with Obstructive Sleep Apnea and he was prescribed Continuous Positive Airway Therapy (CPAP) in which air is pushed through the tubing continuously through the night. Now, he is able to sleep well, feels energetic in the morning and has taken to the gym with vengeance. His bonuses: reduced weight, lowered blood pressure without the medicines and improved self-confidence. Millions of Indians like Iyer are not fortunate enough to decode their turmoil in bed. Night after night they suffer from sleep apnea, without any reprieve enduring ridicule for the loud snoring, which in most instances is a strong symptom for sleep apnea. 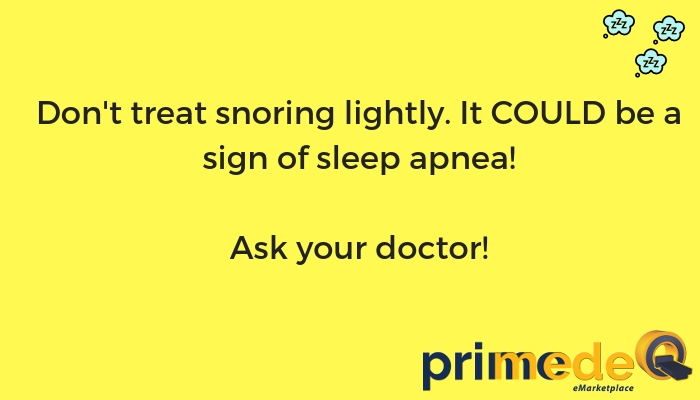 Paradoxically, in our country, snoring, one of the most common symptoms of obstructive sleep apnea is taken as a sign of sound sleep. Patients of Obstructive Sleep Apnea – the most common form of sleep apnea – have pauses in their breath while they are asleep and are forced to wake up more than 100 times to catch on the breath. The poor quality of sleep builds sleep deficit in the patient and the patient can sleep anywhere: in the elevator, between meetings or behind the wheels, which can turn lethal. What causes sleep apnea in Indians? Due to the lack of studies, the number of patients suffering from OSA is strongly underestimated in India. A 2009 AIIMS study, published in Lung India indicates the prevalence of OSA in 13% of the Indian population and out of them only 4% go to the doctor with the symptoms. As compared to Caucasians, we don’t have a prominent jawline. Our faces are flat, as a result of which our tongue presses on the back of the throat. Men are three times more likely to suffer from sleep apnea. How sleep apnea is linked to obesity? Patients of sleep apnea suffer from obesity and have a hard time losing weight. Frequent sleep disturbances through the night impact the quality of their sleep. Consequently, they feel sluggish and ‘pick-me-up’ snacks, desserts, extra caffeine shots give them the glucose surge to sail through the day. Unhealthy eating habits reflect in increased weight. But natural, sleep apnea and obesity are linked together. American College of Physicians recommends losing just 10% of body weight can have a big effect on sleep apnea symptoms. However, losing weight is a big struggle for them, as they don’t have the stamina needed for exercise. Can sleep apnea make you vulnerable to lifestyle diseases? Yes, it does. Obstructive Sleep apnea increases your chances of having diseases which are linked to obesity like high blood pressure, diabetes and heart diseases. Increased body weight is directly proportional to high blood pressure. Apart from obesity, Obstructive Sleep Apnea is an independent risk factor for hypertension. Obstructive sleep apnea is a precursor to diabetes. There is a vicious connection between obesity, sleep apnea and diabetes. Obstructive sleep apnea is a precursor to diabetes. The compromised sleep quality of the patients of sleep apnea, in the long run, sends blood glucose levels in a tizzy. In fact, it is a classic chicken and egg situation. Around half of the diabetics suffer from undiagnosed sleep apnea. Inability to sleep well during the night hampers the effective control of blood glucose levels in diabetics suffering from sleep apnea. There is a need for high suspicion to diagnose and treat sleep apnea when obese diabetics are not able to manage their blood glucose levels. People with cardiovascular problems such as high blood pressure, heart failure, and stroke have a high prevalence of sleep apnea. It’s not clear if sleep apnea causes heart disease, but sleep apnea increases susceptibility to hypertension. Managing hypertension for patients of sleep apnea is quite difficult which in the long run increases vulnerability to heart disorders. How to diagnose sleep apnea? Hitherto, sleep labs were the accepted norm for diagnosing OSA. Of late, Home Sleep Test provides an alternative to the sleep lab at a fraction of the cost. Sleep apnea is a serious concern and you should get it treated to reclaim your life and energy. Start with fixing an appointment with a doctor and inform the doctor about the fatigue levels you experience due to the disrupted sleep pattern throughout the day. Ask your bed partner if s/he notices that you are snore loudly, choke or gasp during your sleep or wake up to catch your breath. Do brief your doctor about the medicines you have at bedtime. Your doctor may advise you to undergo a sleep study at a sleep centre to know in detail about your sleeping pattern. The sleep study monitors a spread of functions throughout sleep as well as a sleep state, eye movement, muscle activity, heart rate, metabolism effort, airflow, and blood O levels. This check is employed each to diagnose apnea and to work out its severity. Continuous Positive Air Pressure device is the gold standard treatment for sleep apnea. In this treatment, you wear a sleep apnea mask which gently blows air into your nose and mouth and keeps it open throughout the sleep. Dental appliances that reposition the jaw and tongue and get rid of excess tissue within the airway is also helpful in the treatment of sleep apnea. Do not treat snoring lightly. It hurts your health and well being. It is high time we wake up to sleep disorders! How to take care of critically ill patients at home?Why choose biphasic defibrillator over monophasic defibrillator?